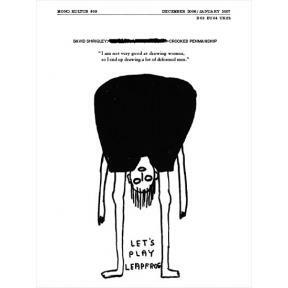 mono.kultur #09 features British artist and prankster David Shrigley. Hardly in need of an introduction, Shrigley introduced the art of the doodle into the gallery, with a decidedly non-artistic approach and a healthy portion of twisted humour – think hairy kids, sexual fantasies of disabled men or whatever else strikes you as particularly perverted. Shrigley has published countless books, worked on several animation projects and is an all-round swell guy. With mono.kultur, David Shrigley talked about his aristocratic ancestors, the limits of political correctness and why he deserves to be called an artist. The issue features original artwork by David Shrigley conceived exclusively for mono.kultur.